It took me at least seven years to learn to surf, at least to a level I thought was adequately competent. There was definitely more than seven steps involved, but I hope this summary from my experience will help you save a bit of time and frustration. The struggle is worth it! Photograph taken by Richard Kotch. Go where the surf’s good. If you don’t live near good surf, move. If you can’t move, well you can go on surf trips but it’ll take much longer to improve. It might be more crowded in places with good surf, but at least the waves will have some shape and appeal. Every so often, you’ll score a wave to yourself that’ll make all the hassle worthwhile. 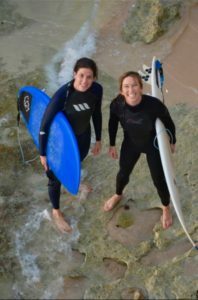 I finally started learning to surf in my 20s on the punchy beach breaks of Perth, the West Australian capital city whose beautiful beaches aren’t known for great surf. I’m slightly embarrassed to admit this (but to heck with shame!) - I don’t think I caught an actual wave for the first two years of my surfing endeavours. There I was, splashing about on my 7’ mini-mal in the short, fast, dumpy waves of Perth schmurf. Despite my total lack of progress, I persevered. After a couple of years, I trekked up to an isolated desert break and surfed a near perfect break on a 1’ day, while everyone surfed another, bigger, break. I caught so many little waves where I travelled along the face, trimming their glassy green surface. Joyful realisation dawned on me - this is what surfing is! Persistence pays off! See?! It only took seven years! My brother started surfing when we were both in high school in Perth, while I was obsessed with ballet. Years later I asked him to take me surfing with him. While he never flat out refused, he also never went with me. It makes sense now that I’ve learnt how to surf, because teaching someone to surf when you’re not an instructor is minus fun. To solve this problem, I recommend learning to surf with a friend. It makes everything more fun and less intimidating. You’re motivated to show up and not let your friend down, even when it’s cold and you’re most likely just gonna get dumped eleventeen times over. The feeling of achievement is enhanced when you share it with a friend. Surf adventures with surf buddies, aw yeah. Photograph taken by Tim, who declared he’d really captured the “essence of Anna and Emer”. I was really lucky that when I decided to finally start surfing, my friend was also keen to learn. Anna was already an impressive wind surfer and ex-surf boat rower. She was confident in the surf and nothing fazed her. For a year we surfed every Friday and Saturday together, plus dawnie missions before work. Surf buddies make for a great bond, and I’ve no doubt that I wouldn’t have surfed as much or had half the fun without them. Paddle like you mean it. If you’re a girl learning to surf, you’re bound to receive advice unbidden from strangers, like “Paddle harder!”. If it annoys you, just smile and offer them advice in return: “Thanks! Your poo stance was much improved on that last ride!”. Truth is most beginners don’t paddle hard enough, but “paddle harder” isn’t the greatest instruction. I was told I paddled really well in the line-up, but when going for a wave I looked like a dainty Tyrannosaurus Rex, frantic hands paddling hard but ineffectually. The best tip I’ve heard when going for a wave is to think of yourself as a car engine. Start in first gear paddling long and slow, crank it to second gear after a couple of strokes, then give it all you’ve got until you’re right at the crest of the wave and feel like you’ll fall down the face. Then give it two more strokes! You might only get one in before you need to pop up. Think about your timing and positioning in the line-up and get used to wiping out. Starting slow and building paddle speed. If you’re not committed to paddling, balking and missing waves, you’re wasting your precious time, energy, and place in the line-up. If you’re paddling as best you can and still missing waves, consider a longer board or one with more volume. I gave up on lengthy instructions on duckdiving, and sod practising in a pool. Get amongst an approaching wall of whitewash or a watery mountain heaving over you, and get motivated by FEAR! Get up front of your board and push down with as much effort as you can muster. There’ll be a sweet spot on your board where it’s easier — practice and figure that out. A successful duck dive comes down a lot to timing the push down. Don’t give me excuses about how little you weigh or how buoyant your board is — timing is the key! Beware of surfers on the wave. It’s better to keep out of the way and cop the broken wave on your head rather than paddling in front of a surfer on the face. If you don’t kick up successfully, the wave will throw you and your board down with it. Use your knee or foot and kick down on the tail pad (or as far back as you can). Aim for the surface, gripping your rails tight. An extra tip is top open your eyes and direct your board to come up in the least churned up water. If you’re on a big board, you can paddle faster to get out of the way or do the turtle roll and I wish you the best! I gave up on that and moved to a board I could duckdive. Duckdiving is a sensational experience. It’s thrilling, the feeling of driving through so much powerful water, having your hair lackey ripped out, and cheering with friends when you do a good one. How super to experience this! Eh, it’s inevitable. You’ll spend way more time doing this than actually riding a wave, at least in the beginning. Surf buddy Anna told herself that getting dumped was fun. I’ve had some amazing experiences getting thrashed about and bumped along under water, weirdly the most hectic were during big winter swells on Perth beachies. The surf guide called me a crash-test dummy. Remind yourself that some people pay for this kind of experience that’s yours for free! 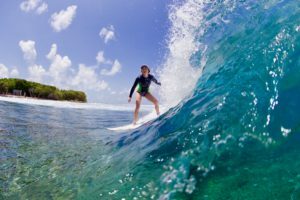 Surfing will take you to some amazing places, but you’re dealing with powerful waves and a lot of foam and fins so there’s potential to get injured. I’ve seen a friend’s board break her nose so my top tip is: don’t allow your board to get between you and a wave! After a dumping, I still come up with my arms cover my head, feeling like a dufus but hopefully preventing a flying board to my head. Hats might make me look like a dufus, but they're good for sun protection and prevents headaches from sun in your eyes . On potential injuries from wildlife, there’s often not a lot you can do to prevent an accident. Two of my friends have been killed by great white sharks, surfing in the middle of a sunny day. Their deaths were tragic and shocking, so hearing people say “At least they died doing what they loved” seems flippant and dismissive. If someone dies at work, we don’t say “At least they were getting paid”. There is no at least in death. If you’re struggling for words, simply expressing sorrow for a person’s loss will do. On the constructive side, you can be better prepared for an accident. Pay attention to wildlife activity such as dead whales, seal pup season, whale migrations, and hazards like fire coral. Have your own first aid kit on hand, complete with a tourniquet (which are controversial but you should know how to use them). 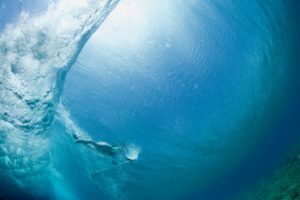 Brush up on your first aid skills because while it’s unlikely, an attack may happen when you’re out surfing and I know I’d rather be able to help with a clear head and some training under my belt. On to the fun stuff. At which point I’ll admit that I don’t have much advice because I’m not that good! I’ll tell you what I do know. Super stoked this day because I’m looking along the face of the wave to where my surf buddy was paddling out and hooting at me from under a rainbow. Have you heard the phrase that the surfer with the biggest smile is having the best time? How great, but pretty irritating when you’re learning and eating salt water and sand and haven’t caught a wave your whole session. At that point style is probably an afterthought, but if you think about it, everyone has their own style built into all of their movements. Surfing can be a physical expression that just happens to be supremely difficult whilst on a a board on a moving wave. Extra tip for style points is to be photographed by an excellent photographer like Richard Kotch, whose skills make me look far more competent than I am. If you’ve had a bad session, it’s nice to sit down and just watch the other surfers still out. After a while, you’ll realise you’re not as bad as think you are, you’ve improved a little, and that everybody else wants to get better. Surfing’s fun to watch, like a dance performance, and some of the best surfers look like they’re leading the dance. At the same time, Laura Enever is one of my favourite surfers to watch because you never know what random, unexpected manoeuvre she’ll have a crack at. Don’t worry about it and just have fun. My favourite part of surfing - the thrill of the drop. Hopefully this will help if you’re learning to surf. I started as an adult but it’s possibly even more rewarding than learning when you’re a grom. There’s a lot of instant gratification these days, whereas learning to surf is such a slow process. Whenever you improve on something, the feeling of accomplishment is that much greater. You don’t have to become an expert but surfing will add joy, drive and satisfaction to your life. Good luck to you! *Note how I’ve included photographs of lefts…I hardly ever surf rights but armed with the knowledge that I now have, I’m sure it’s gonna take me way less than seven years to learn how to surf them!